WASHINGTON DC, Jan 30 2018 (IPS) - In 2010, heavy monsoons led to devastating floods in Pakistan that destroyed 11,000 schools. Thousands of additional schools had to be used as community shelters, preventing them from operating as classrooms. In the immediate aftermath of climate-related events such as this, damage to schools and infrastructure often interrupt a child’s education. This is even more devastating in countries and communities where access to educational resources is already strained. Following damage, repairs to schools and infrastructure tend to be slow and delayed. 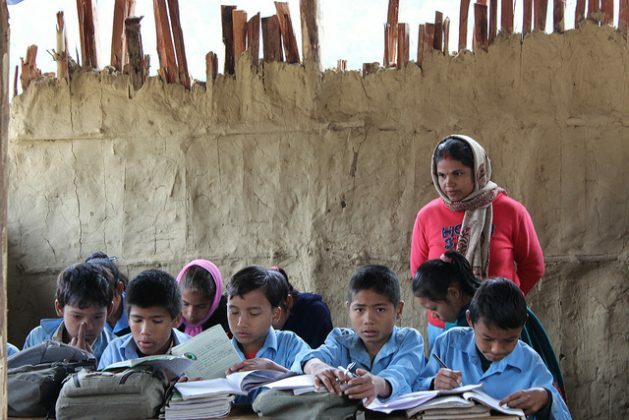 Research has shown an overall reduction in educational attainment, lower academic performance, and higher rates of absenteeism among children who have experienced climate shocks. After these events, children may also miss school due to sickness (e.g., malnutrition during drought, or increased rates of diarrheal disease after floods), injury, or displacement. In the long run, this may reduce lifetime earnings when these children reach adulthood. A recently published Brookings brief highlights the ways that increasing girls’ education can make them agents of change in the pursuit of more equitable climate action. Given the opportunity, girls can be powerful agents of change—and this is one area where their leadership will be sorely needed in the near future. But while more education for girls may help make them, their families, and their communities more resilient in the face of natural disasters, the reverse is also true: these disasters are threatening gains made in girls’ education. Climate events disproportionately affect vulnerable students, particularly adolescent girls. This pattern is particularly alarming, as evidence suggests that climate-related shocks (cyclones, flash floods, wildfires) and stresses (drought, for example) are increasing in frequency and intensity. Due to the potentially profound consequences of climate events on education, researchers and policymakers are increasingly focusing their attention on this link, and its implications. For example, at the Population Council, we are using satellite imagery and remotely sensed data to measure climate shocks and stresses. We are linking these data with information about where people live, including those who are most vulnerable, and where education is most likely to be disrupted. Detailed information about where climate events occur, who is at risk, and why, is essential for policymakers and school officials to take actions that minimize lost school time. These risks are particularly acute for adolescent girls, who have a short window of opportunity to get back to school before they are forced to take a different path—including marriage or migration for work. Climate shocks such as cyclones and floods are acute and often challenging to plan for. Building maps and models identifying high-risk areas can be useful as countries and communities develop strategies for emergency response and resilience building. Take two districts in Bangladesh where the Population Council is working to delay child marriage, which has been linked to environmental shocks and is likely to derail education for girls. 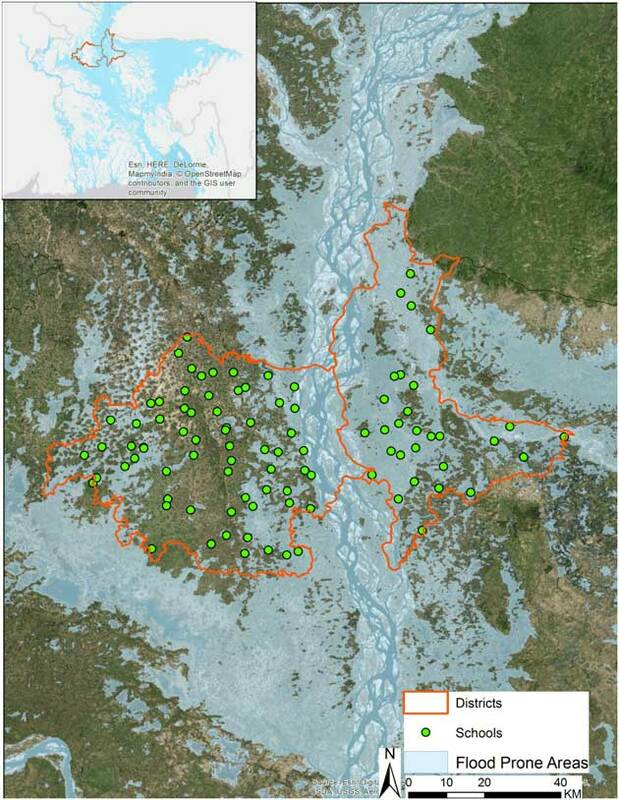 Our analyses show that 45 out of 96 secondary schools are in high flood risk areas (depicted in map below). Using this information, schools and communities can develop action plans to prevent education disruption following climate shocks, such as running double shifts at unaffected schools temporarily. Linking surveys from the schools and students in their catchment area with satellite imagery of flood risk can help us better understand which schools close and under what conditions. We can also learn how communities respond or adapt to challenges, the effects on educational attainment, and the risk of child marriage. With climate-related stresses, such as drought, the effects look to be less immediate or direct when compared to shocks, but they often have significant long-term implications. Droughts destabilize the income of poorer households, many of whom are reliant on agriculture for income. As a result, households may pull children out of school early to have them work in the formal labor market or within the household. Evidence from India, for example, shows that households in areas with high variability in agricultural production may send their daughters to get married in areas with less risk as a way to protect against household income and food shortages. As the risk of climate events increases globally, policymakers and practitioners must integrate information about climate risks and their potential impacts with efforts to promote girls’ education. National officials or international bodies may be able to identify communities at high risk of disruption by using information about communities most affected by climate events. Additionally, short-term support for families with school-age children, especially girls, is needed and may reduce the risk of more permanent schooling disruptions. The relationship between girls’ education and climate events is complex, but work to understand the risks and best practices is growing. But for girls to lead resilience-building efforts in their families and communities—both now and in the future—we must ensure that climate events do not derail their education and, therefore, their opportunities.